This post is intended for those who are seeing an error as shown in the image below while accessing the “My Tasks” link in your SharePoint My site. As you all know for yourself the “My Task” link which you see in your SharePoint My site is driven by the “Work Management Service application” and it’s necessary to ensure that the WMA service is turned on and configured to run successfully. While I say the WMA service is the one that takes care of the “My Task “list that’s not the only component on which the “My Task “ list relies upon . There are couple of other dependencies such as “Search crawl” and “User Profile service” which takes care of the “My Task “list. 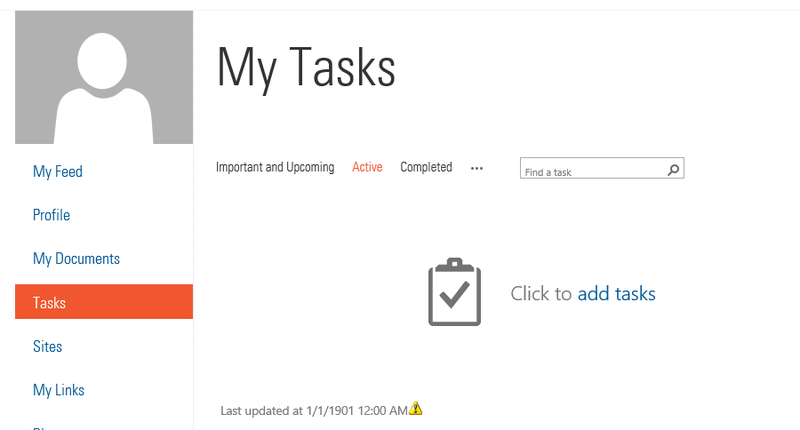 The “My Task” list in your SharePoint My site can display three different type of tasks …. The tasks assigned to you from MS Project if you have that running in your environment and have configured that to sync with SharePoint. The tasks assigned to you using the default SharePoint “Task list “. Tasks can be cached to a user’s personal site. Tasks can sync to Outlook where users can edit them wherever they have access to Outlook. Now, if the WMA (Work Management Service Application ) is not configured properly then you might end up seeing an error as shown in the figure below and you need to perform the below mentioned troubleshooting steps to get this fixed. The Work Management Service Application should use the same account as the web application. Verify whether the service account for Work Management Service application has full control permissions on the User Profile Service application on Central Administration. Verify whether the service account for Work Management Service application has full control permissions on the Work Management Service application on Central Administration. Ensure that you do the above mentioned steps on the instance of the service application which is connected to the My site web application. Grant “Full Control” to the work management service account on the User Profile service application using “administrators” button on the ribbon. In addition to that grant “Full control” to the work management service account on the user profile service application using the “permissions” button on the ribbon. Ensure that the work management service account is given appropriate permissions in the “My site” content database. Check whether the service account of the Work management service application is equal to the identity of the web application pool because this could be an issue with the permissions too. Restart the Work management service and the user profile service on the servers. Add the work management account to the My Site content database with the permissions of SPDataAccess. 12. Perform an IIS reset once done and also restarting the server and critical services is recommended. The tasks are stored in a hidden list called “WmaAggregatorList_User” at the personal site of individual users. WMA aggregates tasks from SharePoint lists created in SharePoint Server (internally called TasksWithTimelineAndHierarchy-171) plus upgraded SharePoint lists from earlier versions of SharePoint (internally called Task-107 or GanttTasks-150). This document explains in detail about the procedure to be followed for patching the App Fabric component in Windows Server. An App Fabric Cumulative Update is exactly the same as a CU for SharePoint, it contains all previous CUs. So if we install CU6 you also get CU1 to CU5 installed. Note: If you want to identify the version of App Fabric installed in your machine and also the CU version which is installed, please go to the “Programs and Features” section in Control panel and take a look at installed updates. The version number would be listed there. The installed CU would also be listed there with the corresponding KB number. Windows Server 2012/2012 R2 32-bit or 64-bit. Before applying the cumulative update, make sure you have administrative privileges on the computer where you’re installing this software. To apply this cumulative update package, we must have AppFabric 1.1 for Windows Server installed. Additionally, we should also have the Microsoft .NET Framework 4.5 installed. A system restart is required after installing the Cumulative Update. Now let’s take a look on the steps to be followed for installing the CU on a server running SharePoint 2013. Once done downloading the cumulative update package to the server in which you’re going to run it, please run the below mentioned to gracefully shutdown the service instance on the local machine. This command will gracefully shutdown the service instance on the local machine. A graceful shutdown means that all the cache items will be distributed to the other service instances in the cache cluster. Wait for minutes to make sure that all the cached items has properly propagated to the other servers. Now it’s time to run the package, run the patch executable and follow the instructions. It’s basically a next, next, finish procedure. The App Fabric 1.1 CU 6 doesn’t need any specific change to be made on the exe.config file like how CU 3 did. So please proceed further by clicking next. Once you’re done installing the CU, please restart the computer. When the machine is back online, please run the below mentioned command to start the service instance again. The App Fabric Windows Service will be disabled when its shutdown and we are not supposed to start it manually. Please use the below mentioned PowerShell command to do that. This command will turn on the Distributed Cache service instance on the machine and will start the AppFabric Windows Service. Once you’re done completing all the above mentioned steps you’re now ready to move on to the next machine. Please allow some time for the newly patched cache service instance to catch up. Finally run the below mentioned commands to check if the Distributed cache service is back online. This will confirm whether the Distributed cache service is back online from a SharePoint as well as from an App Fabric perspective. For any reason, if you don’t see the status of the servers as “online”, please go ahead and run the below mentioned command to remove and re-add the Distributed Cache Service Instance. Run the remove command first and then wait for couple of minutes and then run the add command. At last, once everything looks fine you’re good to go ahead and patch the second server following the same steps mentioned above. It’s always quite comfortable to manage Distributed Cache in SharePoint Server 2013 using PowerShell and the same applies while troubleshooting it also .This articles discusses on the useful PowerShell commands that can be used to troubleshoot Distributed Cache service in SharePoint Server 2013. Use-CacheCluster This is used to enable cache administration via PowerShell. Get-CacheHost This would get you the list of every server in the cluster as well as the state of the service on that server. Get-CacheHostConfig <HostName> <Port> This would give you the general configuration details about a specific host in the cache cluster. All Windows Server AppFabric cache hosts use TCP/IP to communicate with each other and support the cache cluster. The SharePoint distributed cache is an AppFabric cache behind the scenes and it uses the default AppFabric ports for server to server communication. These ports should be allowed through your firewalls for the cacheservice to function correctly. Get-CacheAllowedClientAccounts This would tell which accounts/groups have rights to connect to the cache cluster as clients. This seems to be the standard configuration in SharePoint 2013. Get-Cache Gets a listing of all the default caches in the farm. All caches have the Id (Guid) of the farm appended to the name. Restart-CacheCluster This will restart the distributed cache service on all servers in the cluster and it will also clear the contents of the cache. Stop-SPDistributedCacheServiceInstance -Graceful This will stop the distributed cache service on an individual machine. The Graceful parameter will allow the cache service to migrate cached items to another host in the cluster. Remove-SPDistributedCacheServiceInstance Removes a cache host from the cluster. The best practice is to stop the cache service before you remove it. Add-SPDistributedCacheServiceInstance This command will add the cache host back to the cluster. If there is more than one host in the cluster, it will take a few minutes for the service to start and for any cached items to be synchronized to the new host. Get-CacheClusterHealth Returns health statistics for all of the named caches in the cache cluster. Get-CacheStatistics Gives the statistics for a Cache or for a Cache Host. Stop-CacheCluster Stops the Caching Services on all cache hosts in the cluster. Stop-CacheHost Stops the specified cache host service. Test-CacheConfigAvailability Tests the connection with the cache cluster configuration store. This command will throw an exception if the connection fails. In addition to the commands listed above there are couple of other things which you’re supposed to know while troubleshooting Distributed Cache Service/App Fabric. To get the list of servers that AppFabric thinks there should in the cluster run “Get-CacheHost” (use “Use-CacheCluster” if necessary). This command gives us the list of the servers and also their availability status as far as AppFabric’s concerned. 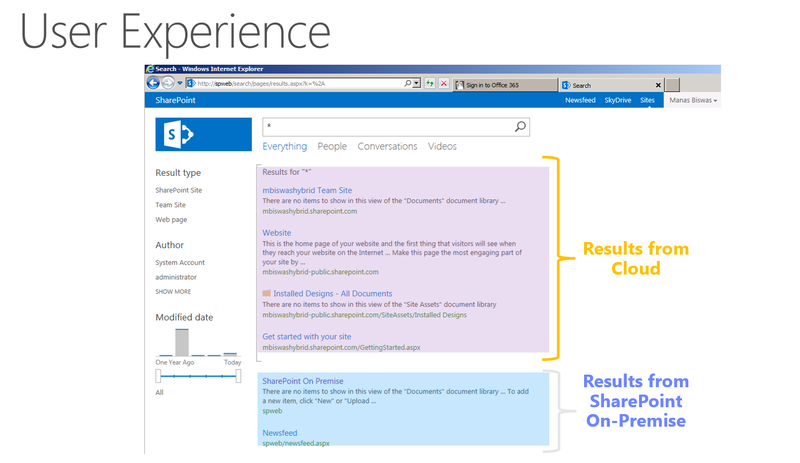 This will give you the same kind of data but from SharePoint perspective. Make sure all the servers show the status as “Online” but more importantly that both SP & AF have the same names between them. If you see “cacheHostInfo is null” somewhere then it’s quite likely there’s a mismatch here. What if one or more App Fabric Service Instance is disabled? Run the below mentioned PowerShell command ….. Remove the service-instance (see above). Verify the new service-instance is “online”. If for some reason Add-SPDistributedCacheServiceInstance doesn’t give you a healthy endpoint, try running Remove-SPDistributedCacheServiceInstance then Add-SPDistributedCacheServiceInstance on the server in question. If you still can’t get a healthy endpoint then it needs some serious consideration. The October 2015 CU for SharePoint Server 2013 has been released today . Do note that this has the fix for most of the issues that was introduced on the August 2015 CU. 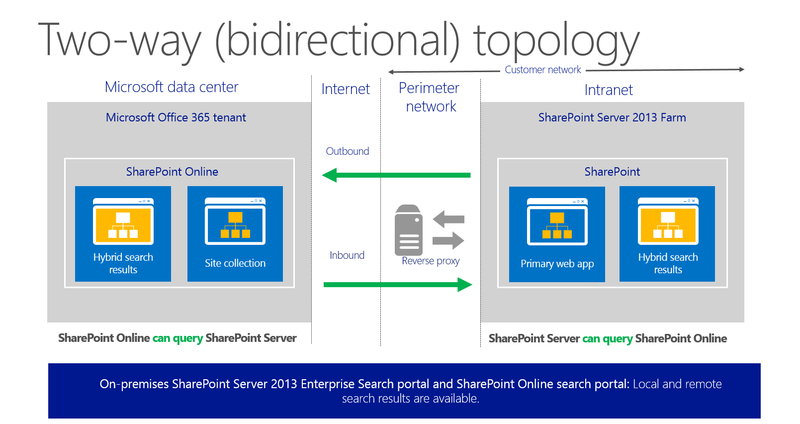 This post is mainly intended for those who want to understand about those services that can go Hybrid on SharePoint Server 2013 and I’ll be mainly discussing specifically about “SharePoint Server Hybrid search” here …. Now as mentioned before I’ll be discussing about “SharePoint Hybrid search” alone in this post and will be discussing about other SharePoint services that can go hybrid in a different post. 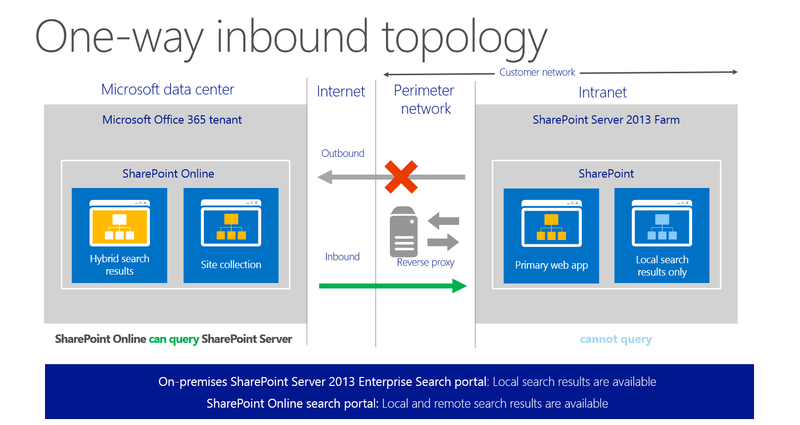 I’m going to keep this post simple by discussing only about what “SharePoint Hybrid search” is all about and the different topologies it has. The configuration part will be discussed on an upcoming new post. 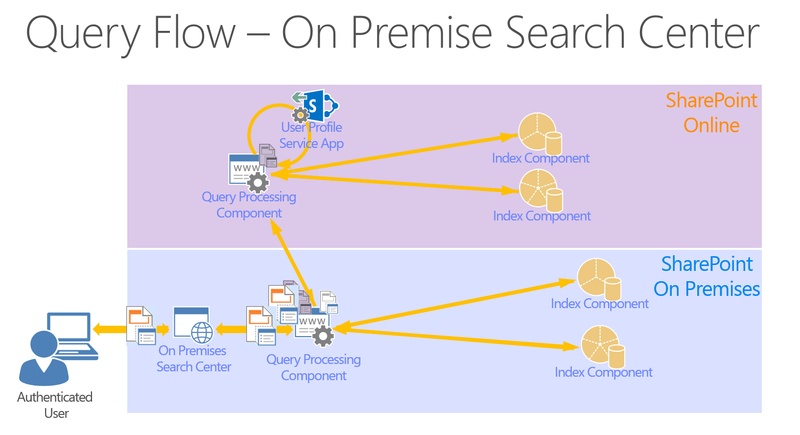 What is SharePoint Hybrid Search? To put it in simple words the term “Hybrid “here refers to using both on-premises + office 365 (SharePoint online) in your SharePoint deployment .If you have an environment where both your SharePoint server and office 365 (i.e. SharePoint Online) is integrated then it’s likely to be called as a “Hybrid SharePoint environment “. 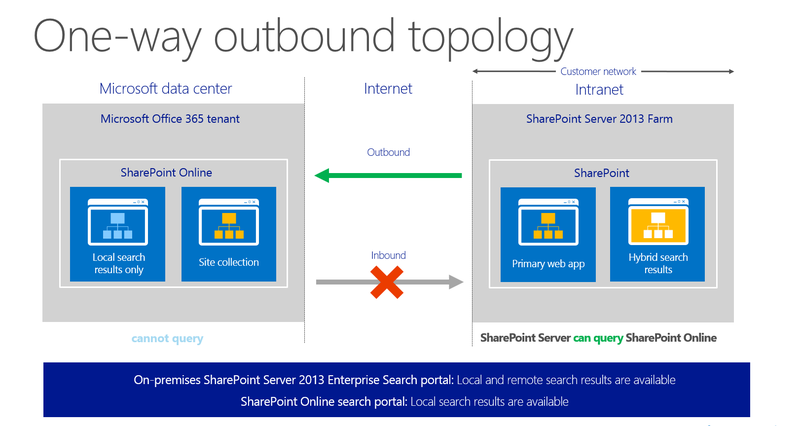 There are three different topologies to speak about that are available for configuring SharePoint Hybrid search and it’s up to you as a SharePoint administrator to choose the right topology that suits the business requirement . The 3 different topologies are ….. In this model the user executes a search query in the SharePoint on-premises search center site and the query component looks for the results from the SharePoint on-premises site as well as from Office 365 and displays it for the user in the search results . Note: The users should SharePoint online license assigned to them to be able to get the search results from SharePoint Online. In this model the user executes a search query in the SharePoint online search site and the query component looks for the results from the SharePoint online sites as well as from SharePoint on-premises site and displays it for the user in the search results. The name speaks for itself. In this model the user will be able to execute a search query in the SharePoint on-premises search site and get results from SharePoint server as well as from Office 365 (i.e. SharePoint online). Similarly, a user who executes a search query in SharePoint online will be able to get search results from SharePoint online as well as from SharePoint Server. The below illustration shows how a user will see the results in the search center when his SharePoint environment is configured for Hybrid search …. This article will discuss on the “My site deletion email message “which the users get when their subordinates “My site” is scheduled for deletion. This mainly takes place because of the “My site cleanup timer job” and it takes care of deleting the user’s “My site “ that is scheduled for deletion .This article discusses about the how the timer job works and what it does . What is the My Site Cleanup Timer Job? Remove user profiles that are queued for deletion. If those users have a My Site, assign the user’s manager as the secondary site owner. Email the manager letting them know that the user’s My Site will be deleted in 14 days. Exactly 11 days after the first notification, email the manager again letting them know that the My Site will be deleted in 3 days. After a period of 14 days, delete the My Site. The first thing which we need to understand is how a user profile is actually deleted. How is a user profile deleted in SharePoint? Now, there are couple of ways on how a user’s profile is deleted with regards to SharePoint. A user profile is deleted when we delete it from the “Manage user profile” section in Central Administration. When a user account which was included in a previous profile import is no longer included in the next import. Suppose you delete a user account in Active Directory and then run an incremental or full user profile synchronization. You would expect that this means the user profile is deleted, and in fact this is picked up as a delete from Active Directory and processed in the FIM, where SharePoint picks up the fact the user profile is deleted and deletes it. What happens when the “My site Cleanup Timer job “runs? Listed below are the detailed steps about what happens when the “My site” cleanup timer job runs …. A user’s account gets disabled/deleted in Active Directory when the user leaves the firm or if the user is terminated. Once the user’s account is deleted/disabled and when SharePoint gets to know about this, the “My site “deletion timer job will be triggered in that user’s account. It first removes the user’s profile from SharePoint and once the profile is removed the user will no longer have access to the SharePoint sites. Well, it’s quite obvious that the user won’t be able to access any resource in the domain as his AD account itself is disabled. This would give the manager complete access to the user’s “My site” including the “My documents “folder. Suppose if the user doesn’t have a “manager” mentioned in his/her SharePoint profile then the timer job will look for the secondary owner of the user’s “My site “.If it finds a secondary contact it will then make the secondary contact as the secondary owner of the “My site “and will send an email to the secondary owner letting him/her know about the “My site”. The email will be sent in 3 parts , the first one will be a notification of the user’s “My site” with a link to the user’s “My site “ .The second one will be sent exactly 11 days after that and this will give a reminder to manager about his/her subordinate’s “ My site”. Finally, the last one will be sent on the 14th day stating that the user’s “My site “is deleted. Note: It doesn’t necessarily mean that the clean job will run on a user’s account only when the user’s account is deleted/disabled in AD. Even if the user’s account is moved to different OU SharePoint will consider the fact that this account is no longer existing in the same OU as the profile synchronization connection is broken and will run the “ My site “ deletion timer job in the user’s account . What happens when the user doesn’t have a manager? Is it possible to customize the timer job? Indeed it’s possible to customize the timer job .You can change the job schedule and you can also plan your own cleanup process. When an OneDrive for Business site collection is scheduled for deletion, the default action is to transfer ownership of the site to the manager of the original work account or school account that is being deleted. For this to occur, the user profile Manager Property must be set for the original owner of the OneDrive for Business site. The Access Delegation setting is configured in the SharePoint admin center. This setting is located in Setup My Sites under the User Profiles section. By default, Access Delegation is enabled. We recommend that you also configure a secondary owner account in this section. This account will be the appointed owner of the site collection if the user profile Manager Property isn’t set for the original site owner. Email notifications will also be sent to the secondary owner account when the value is populated. When a manager or secondary owner isn’t set for the user profile, or if the Access Delegation setting is disabled, the profile and OneDrive for Business site collection will follow the same deletion process that’s described in the next section. However, no email messages will be sent. A work or school account is deleted from the Microsoft Office 365 admin center or is removed through Active Directory synchronization. The account deletion is synchronized to SharePoint Online. The My Site Clean Up timer job runs, and the user profile is marked for deletion. The profile will be preserved in the database in a deleted state for 30 days. This coincides with the time that’s allocated to restore a deleted user account from the Azure Active Directory recycle bin. If the Manager Field is populated for the deleted account, the manager will receive an email message that states that the site will be removed in 30 days and that access to the site is granted to the manager. 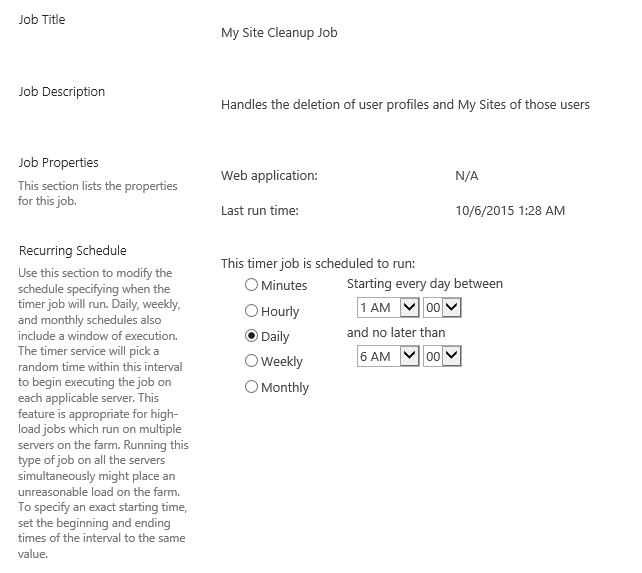 If the Manager field isn’t populated for the user account and a secondary owner was configured in Setup My Sites under the User Profile section of the SharePoint admin center, the secondary owner contact will receive an email message that states that the site will be removed in 30 days and that access to the site is granted to the user. After 27 days, a second email message will be sent to the manager or secondary owner that states that the site will be deleted in three days. After three days, the profile for the deleted account is deleted from the user profile service. The personal site (that is, the OneDrive for Business site) for the deleted account is sent to the site collection recycle bin. The site is deleted from the recycle bin according to the site collection recycle bin retention policy, which is 30 days.